I made this painting while visiting the Outer Banks of North Carolina. I collected the items depicted on the beach of Nags Head. 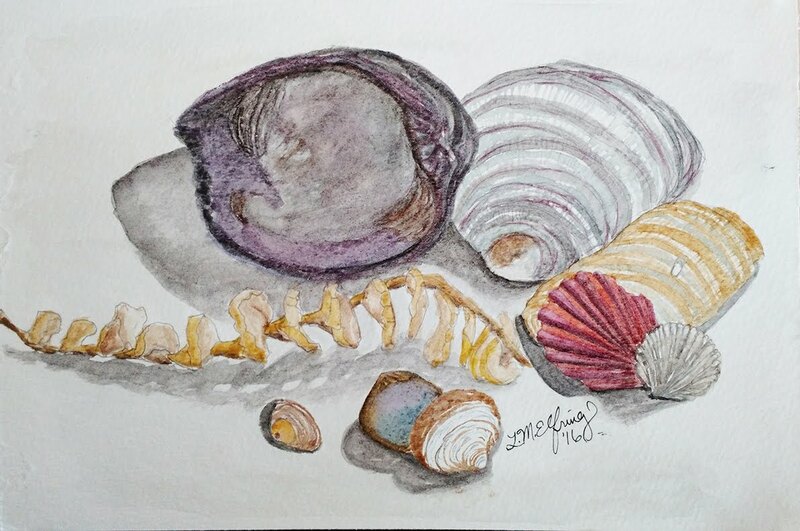 Included in this painting are a variety of shells common to the eastern shore of North America: two Quahog Clam Shells, one showing the purple interior, the other the white exterior; three Coquina Clam Shells; two scallop shells, one a red Calico, the other a white Atlantic Bay Scallop; and a smooth piece of broken shell with pale orange stripes, possibly from a Queen Helmet Conch Shell. The most interesting item depicted is the Knobbed Whelk Egg Chain, commonly called a "Mermaid's Necklace." While this chain was empty, sometimes found chains contain many small shells. These Whelks may have emerged in the ocean prior to the chain washing onto the beach.